M-346FA fighter attack aircraft was unveiled in June 2017. Image courtesy of Anna Zvereva. The M-346FA aircraft is powered by two Honeywell F124-GA-200 turbofan engines. Image courtesy of Leonardo. The maximum speed of the twin-engine M-346FA aircraft is 590kt. Image courtesy of Leonardo. M-346FA is a light attack variant of the Aermacchi M-346 trainer aircraft. Image courtesy of Leonardo. 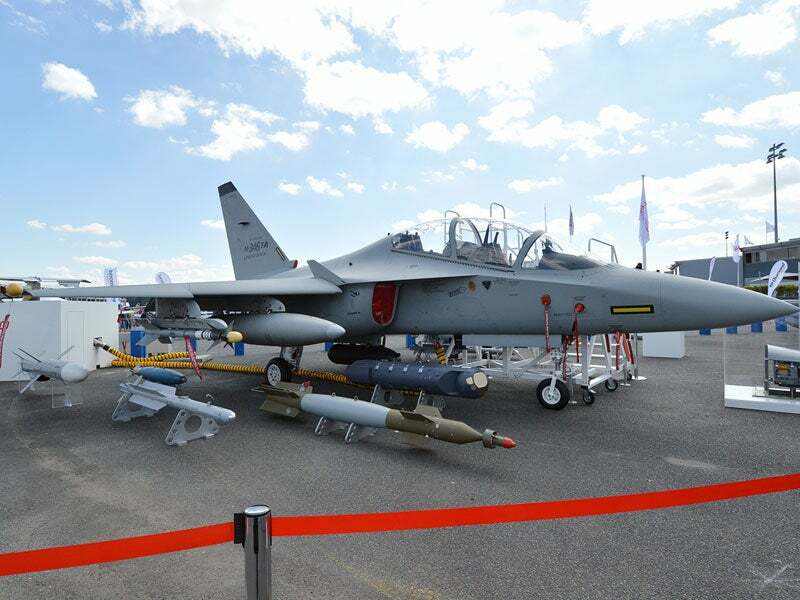 Italian aerospace and defence company Leonardo introduced M-346FA (Fighter Attack) aircraft, a new variant of the Aermacchi M-346 twin-engine advanced trainer aircraft, in June. The new variant is designed to provide enhanced mission performance to the air forces on the battlefield. The M-346FA combat aircraft can be deployed in ground support roles, including air-to-ground attack, tactical, close air support (CAS), counter-insurgency (COIN), and interdiction with precision guided munitions. It is also suited for pilot training, air-to-air combat, air policing, airborne tactical reconnaissance, and airspace control missions. The two existing variants of the M-346 family include the M-346 Advanced Jet Trainer (AJT) and multi-role M-346FT (Fighter Trainer). The M-346FA fighter attack aircraft features a digital glass cockpit accommodating two crew members in tandem configuration. The cockpit incorporates LCD multi-function displays, head-up display, night vision goggle (NVG) device, voice command system, self-protection system, helmet-mounted display (HMD) systems, navigation and communications, and traffic collision avoidance system. The onboard four-channel fly-by-wire flight control system offers increased mission reliability and flight safety. With a maximum take-off weight of 10,400kg, the combat aircraft can carry various external loads such as GPS-guided / laser / unguided air-to-air and air-surface weapons, bombs, and targeting pods to attack air and surface-based targets. A total of seven pylon stations are provided that are capable of mounting weaponry, including Iris-T and AIM-9L air-to-air missiles, rocket launchers, small diameter bomb (SDB), 500lb GBU-38 joint direct attack munitions (JDAM), 1,000lb GBU-32 JDAM, 500lb Lizard 2 laser-guided bomb (LGB), 500lb Lizard 4 GPS/LGB, GBU-12/16 (500lb/1,000lb) Paveway II LGB, 500lb GBU-49 Enhanced Paveway II GPS/LGB, 500lb MK.82HD Snakeye and 1,000lb MK.83 general-purpose bombs. A gun pod can be fitted to house aircraft ammunition. Additionally, the aircraft carries target designation and tactical reconnaissance pods on the external hardpoints to detect and locate the targets in both day and night-time conditions. The M-346FA light attack aircraft is outfitted with Leonardo’s Grifo multi-role / multi-mode, X-band fire control radar to search and track single or multiple targets in air-to-air, air-to-surface and air combat modes. "The two existing variants of the M-346 family include the M-346 Advanced Jet Trainer (AJT) and multi-role M-346FT (Fighter Trainer)." The sensor suite comprises a secure net-centric communications system, tactical data link, identification friend or foe (IFF) interrogator system, and a radar cross section reduction kit. A defensive aids sub-system (DASS) is installed to protect the aircraft against air-to-air and surface-to-air missiles. It consists of a radar warning receiver (RWR), missile approach warning system (MAWS), chaff and flare dispenser, and radar cross section reduction kit. The electronic warfare pods are fitted to the aircraft wingtips to counter enemy radars and detection systems. The M-346FA fighter aircraft is powered by two Honeywell F124-GA-200 turbofan engines, which develop a maximum thrust of 2,850kg each. The powerplant delivers a limit speed of 572kt and a maximum level speed of 590kt. The aircraft has a service ceiling of 45,000ft and can climb at a rate of 21,000ft/min. The aircraft’s limit manoeuvring load factor is 8g/-3g. The high-fuel capacity of the aircraft allows it to endure for two hours and 40 minutes. The addition of up to three 630l external fuel tanks increase the flight time to approximately four hours. The aircraft can perform air-to-air refuelling for both time-on-station and long-range endurance missions.